The Los Angeles Dodgers lost the World Series to the Boston Red Sox last night. The series was chock full of dramatic meltdowns: the Dodgers were obsessed with self-sabotage. 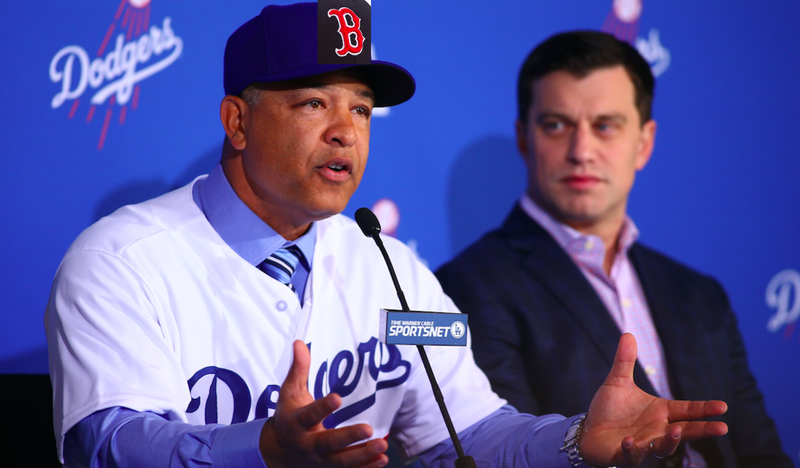 At least, Dodgers manager Dave Roberts was. Because he was actually working for the Red Sox. That’s the only way to explain Roberts’ decision to put washed up reliever Ryan Madson into games with runners on base not once, not twice — but three times! My favorite fact/statistic from the World Series this year is this: Madson allowed every single runner he inherited to score. Madson is the main reason that the Dodgers coughed up a 4–0 lead in the middle innings of Game 4. At that point, the Dodgers were still riding high from winning the battle of wills that was the longest World Series game ever, Game 3. It took the Dodgers and Red Sox seven hours and twenty minutes, and eight innings, both World Series records, to play that game. The Dodgers outlasted the Red Sox, and they took the initiative in Game 4. Rich Hill kept the Red Sox off the board, and Yasael Puig hit the home run that seemed to be the turning point of the Series: the Red Sox, and especially the pitcher who coughed up the homer, Eduardo Rodriguez, were visibly crushed. With the Sox’s spirit broken by the Dodgers’ endurance and Puig’s dong, only time stood in the way of the Dodgers’ inevitable glory. Until Red Sox hero Dave Roberts put in Ryan Madson — the man responsible for putting Games 1 and 2 out of reach. We shouldn’t be surprised. The most famous moment of Dave Roberts’ career was stealing a base in the 2004 ALCS for the Red Sox; that moment led to the Red Sox’s first World Series win in decades, and the Red Sox’s rebirth. Dave Roberts set off the process that transformed the Red Sox into the American League’s premier club — the new Yankees. This is all well known. Yet eventually the notes from baggage handlers stopped. Dave Roberts needed the validation. It was an itch he couldn’t scratch, a dragon he couldn’t catch. Nothing matched that moment. Nothing was ever better. He was a Red Sox legend forever, but he wanted to feel it. That thirst for heroic validation, coupled with the Red Sox’s famous training/teambuilding techniques, drove every decision Roberts made in the World Series. This seems shocking, but, really, the signs were there. How did we miss the dead giveaway (pictured above) at Roberts’ introductory press conferences? Amazing stuff. Congrats to Dave Roberts and the rest of the 2018 Red Sox!